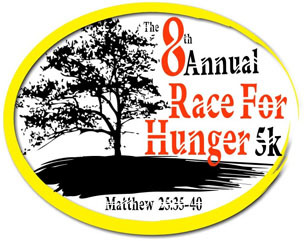 SAVE THE DATE - OCTOBER 10, 2015: The Race for Hunger is a 5K run/walk that takes place on a flat course along the beautiful Little Miami River bike trail in South Lebanon, Ohio. Callibrity has been a major sponsor of this great charity race for the last two years. We have been able to help many needy families in our area as well as many students through the Panther Backpack program. Registration begins at 7:30 am and the race begins at 9:00 am. Again this year, there are three ways to participate. You can register to run, walk, or “Sleep in for Hunger.” You can sleep in and still help feed hungry people by registering online. Please register and also like us on Facebook. Please invite your friends and come out and enjoy the morning by helping people less fortunate than you. Included in your registration fee is a long sleeved t-shirt and a goody bag. The registration fee is $20 for pre-registration and you will be guaranteed a t-shirt and $25 on the day of the race.